TenantNet Forum • View topic - Rent Stabilized Rent Hike - Is this Legit? Rent Stabilized Rent Hike - Is this Legit? Ok, so I'll try to sum up the important aspects, maybe someone could help advise or direct me if I'm woefully out of luck. If I'm missing important details from the lease, just let me know! Short Version: Moved into my dream apartment about a year ago. Received lease renewal today. Rent was increased $200/month. Was under the impression that my rent couldn't be raised more than 2.2%/year as it's a rent-stabilized apartment under the 421-a tax program. Apartment is Rent Stabilized via 421-a tax benefit program through 2026. RENOVATIONS DONE SINCE MOVE IN - NONE That we're aware of. Any advise? Is this legal, any questions I should be asking the landlord? Any other info needed to know my situation? 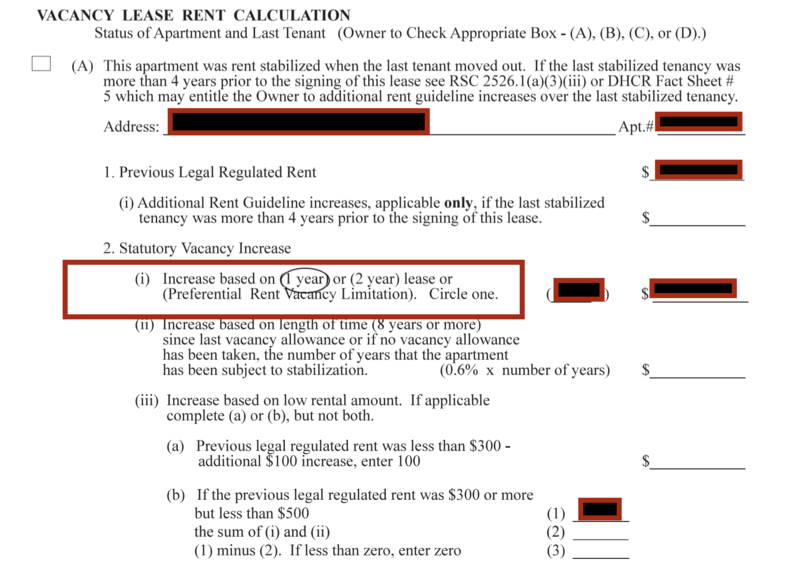 Re: Rent Stabilized Rent Hike - Is this Legit? Look through all your documents and see of there is anything with the words "preferential rent." Tell us what you find. TenantNet wrote: Look through all your documents and see of there is anything with the words "preferential rent." Thanks for the reply. This is what I found. Oops, think i pasted a URL wrong above. Just edited in case you were confused. Thanks again. You're jumping back and forth and editing previous posts, so it's difficult to figure this out. Also you might speak to other tenants to see what they have experienced. Is the building 421-a program managed by DHCR or HPD? Either way, you can look at the regulatory agreement. And to be honest, if you're paying that much, you can probably pay for a consultation with a tenant attorney. You don't say what the document is that you've posted pieces of. Is it the lease, or the DHCR informational rider? Pref Rents (PR) are very specific what must be done in order to lift the PR discount. See http://www.nyshcr.org/Rent/FactSheets/orafac40.pdf and read this carefully. PR rents also have a separate rider or lease clause that allows the owner to lift the discount. If it's not there, then the PR is for the life of the tenancy. You also don't say what the legal rent has been during your first year. And is this your first renewal? You don't give us the dates of the initial year and any subsequent year(s). So we're missing essential information here, or it's not presented in a way that can be understood. The legal rent and the PR follow separate tracks. I'm guessing the new lease offer has increases of 6% (1-year) and 15% (2-year). Is that correct? I have requested a rent history from DHCR, but so far it hasn't come. I have also reached out to a few tenant lawyers, but being around the holidays, I haven't had much a response. To your question, yes the new rent in a 6.6% increase. increase in three (3) different years, the landlord may thereafter, at any time during the tax benefit period, add a total of 6.6% (3 x 2.2%) of the rent in effect on the surcharge commencement date to the rent charged for the apartment. increase in three (3) different years, the landlord may thereafter, at any time during the tax benefit period, add a total of 6.6% (3 x 2.2%) of the rent in effect on the surcharge commencement date to the rent charged for the apartment." Does this example of 3 years, indicate for a single tenant? Or is it that they can raise the rent 2.2% x [years] regardless of who held the lease during this time. Sorry If i confused you earlier. The images I posted were from the Lease, with the header "New York City LEASE Rider For Rent Stabilized Tenants". Thanks for your time and any other advise/feedback. 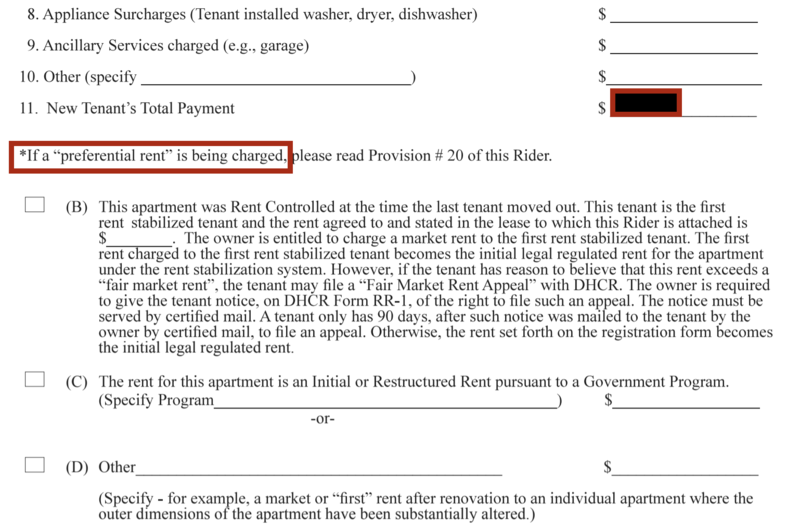 Is that the official DHCR informational rider (http://www.nyshcr.org/Forms/Rent/ralr1.pdf), or is it a rider the LL has come up with and attached to the renewal lease? Seems that could be the latter. In the official rider search for "421" and look at that language - page 6. Seems different from what you've cited. In general, RS leases cannot be changed during the life of the tenancy. The LL cannot change the terms or conditions of renewal leases and must stay the same as the initial lease. I would not presume that anything the LL does is legal. As for the $200 and other stuff, I can't really opine without knowing the source of all cites, and then doing a bit of research (with apologies, I can't do that now). As I said above, you might do better with a tenant attorney consult. They are probably much more on top of 421-a rules, and you would be able to show him/her all the documents you have, so there would be no confusion.